The name Soul Food Design Depot & Gallery evokes delicious food accompanied by beautiful art. In this regard, visitors to the Narromine business will not be disappointed. Opened in 2014, Soul Food began as a design hub featuring a cafe, along with homewares, gifts and art and has evolved to include an event space for weddings, school formals, presentation nights, art exhibition launches and more. Soul Food is a licensed café offering all day breakfast, lunch, Allpress coffee and sweets as well as a cook-to-order menu. They stock a variety of gourmet food products including relish, chutney, jams and salad dressings, relying significantly on the local butchers, egg farmers and fruit and veg shops as well as the local supermarket to provide the best quality produce. Gourmet products stocked on the shelves are all Australian made, with a significant portion sourced from local producers. The gallery is constantly filled with local and regional artworks, including paintings, prints, sculptures and handmade furniture. Proprietor Mel Hamilton enjoys welcoming people into the space, and describes Soul Food as a community-based entity serving individuals and businesses in Narromine and across the Central West. The venue can host and cater for meetings and workshops, tour groups, birthday parties, christenings and various other celebrations with options of the workshop room for 30 people, the main gallery for 80, or the event space which fits 300 cocktail and 200 seated – an area which provides opportunities for business growth. There is also intention to incorporate a wedding planning service into this aspect of the business. Soul Food also offers an off-site catering option as well as a packaged pick-up option. Mel attributes the business’ success to the dedication of staff who have enabled the Soul Food Design Depot & Gallery to grow from strength to strength by being supportive and flexible. “Our strengths are we make great coffee for a small country town and employ wonderful staff with friendly smiles,” she said. Challenged by the need for additional promotion in a growing customer area, there are plans for a greater social media presence and billboard advertising in the near future. The future direction of the Soul Food Design Depot & Gallery is to serve the best coffee in the Central West and continue to provide fresh food which is baked and prepared on the premises by local staff. Soul Food also aims to provide a beautiful space for the community and travellers to call in and relax and catch up with friends along with extending its catering service to regional towns throughout Australia. 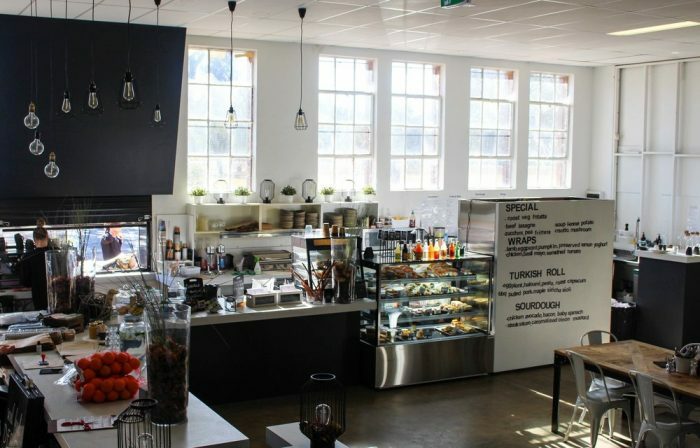 Soul Food Design Depot & Gallery is located on the corner of Dandaloo Street and Culling streets, Narromine, and is open as a café from Monday to Saturday 7.30am to 3pm through the loading dock (takeaway window)and from 8am to 3pm on the gallery floor.